At last! Now that the Baby Boomers and even the Millennials are just beginning to think those thoughts of "Am I getting old? Not me!" Now comes “Compound 14”—a recently discovered molecule triggers “a chain reaction of events in the cell that . . . well, to make long technical story short, tricks human body cells into “thinking” the body has just been for a good, solid workout. Or, put differently, “ZMP” the master regulator, sends the signal that activates “AMPK” the cells’ central energy censor. Got that? Bottom line: alas, Compound 14 isn’t for sale yet at the corner drugstore, but the work, headed by Ali Tavassoli, a professor of chemical biology, and Felino Cagampang, an associate professor in integrative physiology, is underway at the University of Southhampton in England. The study, published in the journal, Chemistry and Biology, details how Compound 14 was given to two groups of mice, and the fat, chubby group lost five percent of body weight after receiving it for seven days. Is that not a big step toward the Fountain of Youth (at least for mice)! Who knows what wonders await us, thanks to the tools of bio-engineering and synthetic biology . . . provided somehow we can slow the human aging process so we can all hang around until those wonders do arrive. If you've keeping up with this blog, you'll have seen other stories about growing replacement organs. So what's distinctive about this? This is reportedly the first time the organ has been grown inside the target creature. When can we expect to find something like this happening for humans? According to one scientist, maybe ten years and tens of millions of pounds for research. But by then, odds are the products will relate to other elements in the quest for radical life extension. The article raises this question: "Are myths about the rejuvenating powers of young blood true?" The answer, as I discern it from this and other literature: Definitely yes and no. Not long ago here we posted about some research in Lund, Sweden attempting to rejuvenate blood (of mice) by reprogramming stem cells. Link to that post and the article on rejuvenating blood The broader topic there, of course, is the search for methods of achieving radical life extension. We just posted a new book trailer on Slideshare. It gives a brief overview on various breakthroughts on what is termed "radical life extension" -- most of which we have posted over the past few years on this site, as we came on news of these various pieces of research, and as they were relevant for the technothriller, A REMEDY FOR DEATH. Among the topics touched on in the slideshow (and in this blog) are these: anti-aging methods, bio-engineering, bio-artificial organs, chimeras (human-animal hybrids), quest for eternal youth, human stem cells, human cell implants, human immortality, medical ethics, organ fabrication, organ harvesting, organ regeneration, regenerative medicine, growing human body parts, tissue engineering, transhumanism, reversing the aging process, 3 D printing of replacement human organs, and more. Well, maybe not quite yet. But work is underway. In Austria, researchers took both embryonic stem cells (i.e. from human embryos) and adult skin cells, then did some "lab magic" and in about a month the cells grew and self-orgaized into what the researchers termed "brain-like organoids" 3-4mm in size that showed "neural activity". Think of it! A few flakes of skin can become the startings of a human brain. Now that's not to say that these litle bits had consciousness, that's many more steps ahead. This work was reported on in Britain's New Scientist , BBC News , Washington Post via Reuters , Siongularity Hub and others . What about the ethical issues of growing even a tiny human brain? The researchers are aware of the issue, and the Austrian team does not want to see larger human brain specimens grown now, as that would be "undesirable." Gary Marcus, in a New Yorker article, looks at this same research, though taking a much longer look at the implications of where this kind of work may lead decades or a half-century from now. "But we’ll also need to confront immense ethical quandaries. What rights does synthetic brain tissue have? Should a 3-D-printed brain have the right to vote? To an education? To terminate its own life? (Or to not be terminated?) For now, these questions are still just another round of thought experiments. But it’s more likely than ever that such thoughts might some day be held by just another brain in a jar." Beyond all that, there's still one other big issue: even if we can "grow" a complete human brain, where is the mind? 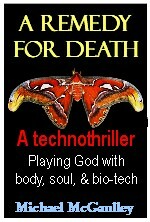 That is the biggie we tackle in my technothriller, A REMEDY FOR DEATH --Playing God with Body, Soul, and Biotech, . . . though suggesting an approach other than bio-science. If you're on this page, you likely know that my technothriller A REMEDY FOR DEATH deals with, among other issues, questions of medical ethics, including organ and tissue regeneration, cross-species "trading" of tissues and stem cells, and the ultimate question of, When does death in fact occur? In this blog, I've included a lot of my earlier research used in working out A REMEDY FOR DEATH, and I'm still adding new articles and studies that I find with some or a lot of relevance to the book. Hence you may be interested in the opinion piece in London's Daily Telegraph "Tampering with embryos is tampering with souls" by Jacob Rees-Mogg, a member of the British parliament. The piece picks up from a debate in the House of Parliament on the issue of "three parent embryos – or rather mitochondrial transfer". Legal: "This is a self-evidently dangerous road to start down as although the technique cannot at this stage affect eye colour, eventually there will be therapies that will. Once this line has been crossed the argument against going further is merely a matter of degree rather than absolute. Its current aim is small, that ten children each year that might have been born should be replaced by ten different babies. This is not a major problem yet the solution is a fundamental change in our understanding of our own humanity." I'm not going to go further, except to add that in his bio, Mr. Rees-Mogg demonstrates exceptional wisdom and prudence by stating clearly " He is not on Twitter." Amen to that! I say. By the way, if you object to the word "soul" in his article, you're welcome to adopt the terms "conscious essence" within the "Vehicle" -- terms that some of the characters use as alternatives to "soul" and "body" in A REMEDY FOR DEATH. Not to spoil the plot, just to say that it's about a bunch of rich old guys (yeah, just guys) who're funding a kind of Jurassic Park for "select" humans--themselves and other elitists. It gets into bio-tech, bio-artificial organs, organ harvesting and regeneration, regenerative medicine, and, ultimatelym,into the quest for eternal youth and immortality. Here are some sample chapters. Hope you're intrigued! TIME Magazine ran a cover story a few weeks ago , which we covered here in the post: New Google division, along with TIME Magazine, follow trail blazed by technothriller A REMEDY FOR DEATH! Now London's DAILY MAIL has an article on one of those Google executives, futurist Ray Kurzweil, who joined Google a few months. His aim, it seems, is to hold his existing body together long enough for robots and computers to be developed to provide a surrogate kind of life. "Kurzweil says he hopes the supplements will keep him healthy enough to reach the 'nanotech revolution'. "'I can never say, “I’ve done it, I’ve lived forever,” because it’s never forever,' he said. "'We’re really talking about being on a path that will get us to the next point." For more on the same topic. see my post here, "Tech billionaires determined to buy their way out of death"
"Lund University researchers have succeeded in rejuvenating the blood of mice by reversing, or reprogramming, the stem cells that produce blood." -- this from Kurzweil Accelerating Intelligence News. I'll leave it to you to follow the link if you want to know more. The research is still early, so best to wait and see how things work out.